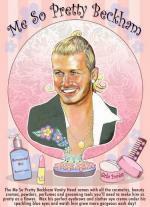 There is something of the Basil Fotherington-Thomas about David Beckham. The former England captain is not all that unlike the “gurl” from the Molesworth books. Hullo clouds, hullo sky, hullo angel at the top of my arm. Hullo. Becks has a new tattoo. In time to come, Dave may just use photographs of his skin to form the substance of his autobiography. These days you don’t look at Beckham, you read him and appreciate the artwork. And what art it is. The Sun has a picture of Dave’s new-look right arm. It features an angel and some clouds. We can gaze at the clouds all day and see what shapes they make as Dave flexes his muscles and, in time to come, surely puts on weight.